Islamedia - Netizen bernama Lisa A. Shanklin yang mengaku sebagai warga negara Amerika Serikat menuliskan bahwa dirinya telah memeluk agama Islam setelah menonton pidato Donald Trump saat kempanye presiden. I have now decided that on Inauguration Day: January 20, 2017; I will begin wearing hijab in public at all times. I have been reluctant to do so thus far, mainly because I was not raised muslim; and I did not want to represent almost 2 billion Muslims to the average Jane or Joe on the street. But now I say I only represent me. I do not have all the answers about a centuries old religion, I am not always in a good mood, etc. But I will stand against HATE of any kind towards others. Trump won't need to give me a badge to wear. I will PROUDLY wear hijab and I will call people out on their bigotry of all kinds privately and publicly! 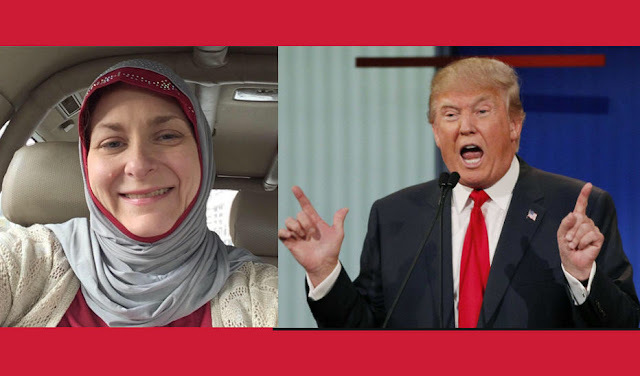 Friday, January 20, 2017 = Lisa A. Shanklin chooses hijab in public henceforth!!! InshaAllah.